Species: Orris root (rhizoma iridis) is the root of two different Iris flowers, Iris germanica and Iris pallida, which are plants in the Iridaceae family known for their beautiful flowers. 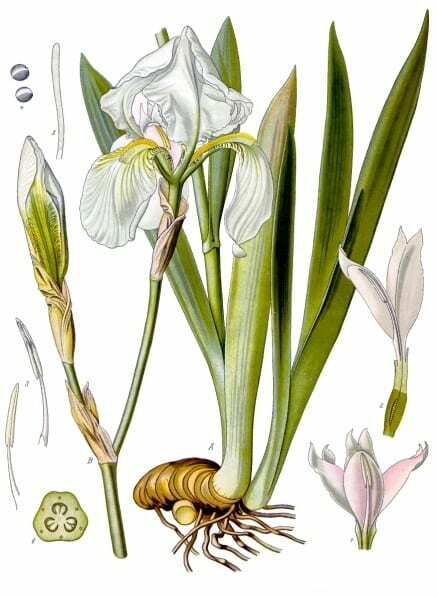 Geography: Although both species are widely distributed, Iris pallida is originally native to Croatia, with recognised subspecies originating in Slovenia and Italy. Iris germanica is known as the German bearded iris and is a European hybrid species. Characteristics: Irises can grow over a metre high and the leaves can be up to half a metre long. The roots, meanwhile, can be around 10cm long. For gin, the plants are usually developed for three to five years before the roots are harvested and peeled. They are then left for as long as five years to dry, before being ground into powder, added to water and distilled. In gin, orris is a base note binding and stabilising the other flavours and manifests as an earthy, woody, sweet, flowery aroma similar to violets or raspberries. Other Uses: Orris root powder’s main usage is not gin, but perfumery. The powder is very common in potpourri, but when distilled it condenses into a waxy, yellowish substance known as orris butter or orris concrete. This substance is commonly used as a base note in perfumery, notably in Y by Yves St. Laurent and Chanel Nos. 5, 19 and 28. Due to the high cost of production – one ton of the root produces only two kilos of orris butter – it is used sparingly. Orris root powder is also used as an ingredient in the Ras el hanout spice mix commonly used in North Africa and the Middle East and particularly prevalent in Moroccan cuisine. A tincture of the orris root is also sometimes used to flavour syrups. Orris root is also popular in the nonsense community as an ingredient in love potions or in incense burned to invoke the spirit of Iris, the goddess of rainbows, to charm the passage of the dead. ‘Natural’ medicinal practitioners, meanwhile, recommend it for impure blood, unstimulated glands, puffy throats, headaches, toothaches and digestive issues. In Japan, orris root is used to ward off evil spirits. Used In: Orris is a very popular botanical, featuring in Bombay Sapphire, Sipsmith, Beefeater 24, Plymouth Gin, Hendrick’s, Brockman’s, Hayman’s, Gordon’s Pink Gin, Drumshanbo Gunpowder Gin, No. 209 and Ki No Bi among many others. The origins of the Iris in common mythology are charming and varied. In French folk tales, Iris was used at the crowning of King Clovis I around 509AD – Iris is also believed to be the fleur in the famous fleur-de-lys heraldic symbol, despite not being a lily as the name implies. Another origin myth is that the iris sprang from Eve’s tears after the expulsion from Eden. Orris is apparently commonly used in magic rites for protection, exorcism, love, and to stop gossip. Orris root powder is highly allergenic, inducing hay fever, asthma and the occasional death; the sale of the pure root powder was banned in the USA and parts of Europe for this reason.